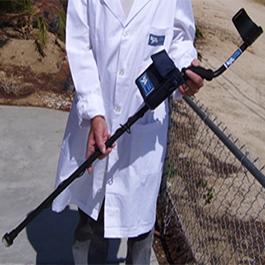 The Leak Pro® probe will identify the line and hears the water leak under the concrete. 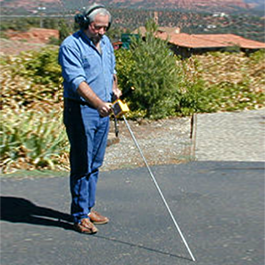 The most versatile tool to locate leaks. Stand alone product but designed to be used with the Air Anywhere Kit and Helium locator. The Air Anywhere Kit can be remote-controlled from up to 200 ft. away. This allows you to hear only the bubbles under the ground not the pump running in your vehicle. 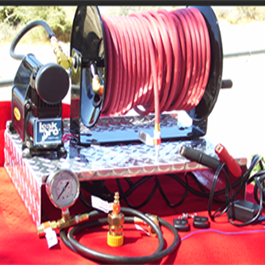 The 12 V pump can be stored in your vehicle and includes 150 ft. of special air hose. The Magic Wand Helium Locator comes with a helium flow gauge and special adapters for water lines. Big change in the leak locating business. Outside noise not a factor. When the lights light up you are standing on the leak. For a limited time only, you can purchase these three items for the cost of one leak locating device! Contact us today for more details on this offer. Used for small areas like bathrooms and under the floors. 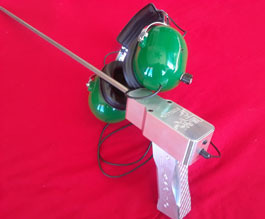 Makes listening to angle stops less of a problem and more of a breeze. Anyone who purchases Leak Pro Products, gets our lifetime phone support!